This is a relaxed offshore summer race organized by the yacht clubs of Palermo and Monte Carlo. It is not a “top shelf” race like the Copa del Rey, or Giraglia Rolex Cup, or Les Voiles de St. Tropez, but it’s quite exciting to have the finish and hospitality in Monte Carlo! The race could be compared with the RORC Caribbean 600, but with less predictable winds and much more demanding weather routing. Ideal for sailors who prefer to travel with hand luggage only and enjoy a warm breeze and warm water and enjoy the challenges of tricky tactics. The landscapes of Sicily, Sardinia and Corsica are amazing! 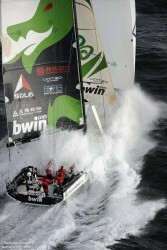 For an even more challenging Mediterranean Offshore Event you could also consider the RORC Middle Sea Race in October.